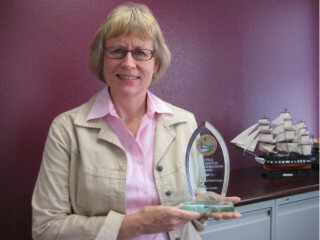 Condominium rentals continue to represent the largest source of Tourist Development Tax revenue among Sarasota County accommodations, Barbara Ford-Coates, the county tax collector, told members of the Tourist Development Council during their regular meeting on March 17 in Sarasota. Hotels and motels make up the second largest group, Ford-Coates added, with houses slightly edging out apartments, as they have for the seventh consecutive year. Yet, collections through January of the current fiscal year — which began Oct. 1, 2015 — are up almost $350,000 over the same period in the past fiscal year, Ford-Coates said, with the December 2015 amount 13.4 percent higher than the revenue collected in December 2014. “We’re obviously hoping for another record-breaking year,” she told the advisory board. One significant factor that could help, she continued, is the signing of an agreement with Airbnb, the Internet-based vacation rentals organization. The Airbnb logo is from the vacation rental company’s website. On March 21, Rana A. Moye, deputy tax collector for Sarasota County, told The Sarasota News Leader, “We are still hammering out some final language” in the agreement with Airbnb. She confirmed that the department will send out a news release after the document has been finalized. 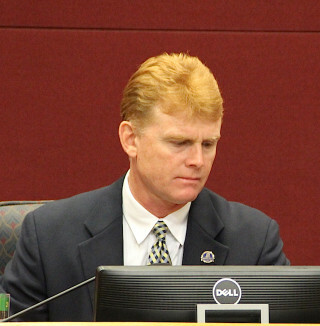 On March 17, County Commissioner Charles Hines, who chairs the Tourist Development Council, asked that Ford-Coates return to the advisory board for an update on collections from Airbnb as soon as numbers are available. He added that he was curious about how much of an impact that source of revenue would have on overall figures. “It may be quite a while before we have any feel for that,” she told him, because of the lag between the end of a month and when collection reports are due. For example, she said, entities that collected revenue in January have until March 20 to provide those figures to her staff. When Venice City Councilman Bob Daniels asked how Ford-Coates and her staff register a new entity as a collector of TDT revenue, she told him, “We trigger off everything you can possibly imagine,” including tip lines and random mailings to condominium owners. Ford-Coates added that she and her staff also have been discussing how to make certain that people who rent their homes to participants and visitors during the 2017 World Rowing Championships at Nathan Benderson Park collect TDT taxes; he and her staff probably will put a special note about that situation in tax bills this year. The Championships are scheduled from Sept. 24 through Oct. 1, 2017. Most people her office contacts who have been renting properties without paying the tax readily comply with the law after they learn of their responsibility, Ford-Coates said. Ford-Coates’ comments reflected information in her office’s 2015 report on the Tourist Development Tax, which is available online. Along with the statistics she provided on March 17, the report notes that as of Dec. 31, 2015, 8,744 TDT accounts represented 15,405 units, a 3.79-percent increase in accounts since 2014 and a 3.02-percent rise in the number of units. The largest increase documented for a category in the 2015 fiscal year was for houses, the report says. That number climbed from 1,374 to 1,591. During another presentation as part of the March 17 TDC meeting, Paul Blackketter, president of the Suncoast Nature Center Inc. (SANCA) — the nonprofit organization that manages events at Nathan Benderson Park — reported that SANCA had set a goal of hosting 33 events last year, but it actually handled 37. Additionally, he said, while it had projected 32 rowing teams would train at the venue this season, 50 have been scheduled from around the world. Interestingly enough, he pointed out, the team from Eton College has been training this season at Benderson Park. Its home venue, Dorney Lake — near Windsor, England — hosted the 2012 Olympic rowing events. In terms of economic impact on the region, Blackketter noted that the park was projected to contribute $11.4 million in 2015, but the final figure was $26 million. In regard to the capital improvements at the site, Blackketter explained that the Finish Tower is expected to be completed in November, while restrooms will be finished in April. “The architecture’s amazing,” he said. SANCA’s most recent newsletter explains the restrooms will stand at the north end of the park, near the 500-meter mark. The $2.5 million the park received from the Florida Legislature in its 2016 session will be used for infrastructure on Regatta Island, Blackketter continued. New permanent facilities represent fewer structures the park has to rent for events, he pointed out, stressing that those amenities are also for the general public. 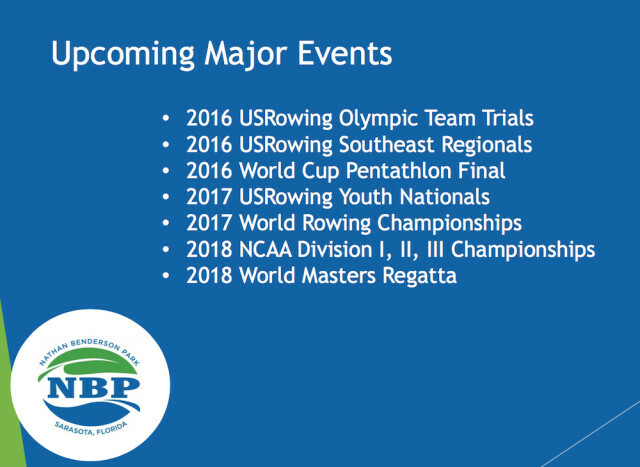 Fundraising for the boathouse continues, Blackketter said, though “you don’t need the boathouse for the [World Rowing Championships].” A number of venues that have hosted the international event have not had boathouses, he added. The boathouse will include meeting rooms that can be used for a variety of functions, he has explained in the past. 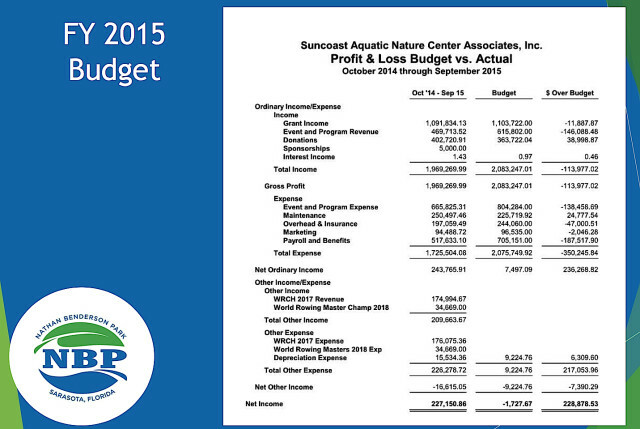 The revenue from those events is seen as SANCA’s means of becoming financially self-reliant, instead of dependent on Sarasota County funding assistance, he has said. After the Finish Tower is completed, he pointed out, full-time programming at the park will grow.